My family has passion. Or maybe it is stubbornness. I like to call it passion. When we believe something we put our whole soul into it, sometimes to our detriment. It is often very hard to change our minds on a subject. However, it can be used for good when placed right. I had two grandparents that were ministers and my great grandfather was a minister. My mom and dad taught Sunday school from as young as I can remember. My dad is also one of the few that can beat me in Bible trivia. (My wife might be the only other one.) I also have a brother who is a minister too. This passion runs deep in our family. Even some that attend worship services on an irregular basis, passion runs strong. My Grandfather passed away when I was 17 years old. I remember reading his diaries about how a loaf of bread had shot up to 10 cents a loaf, how he went fishing, but most importantly how many times he had read the Bible through. 29 times my Grandfather had started at Genesis and read through the rest of the book. I decided that day that I would match that in my life. Now I don’t know if I will, because I always get bogged down in Leviticus. So instead I just determined to read every book in the entire Bible in a year. Just not in the order that is in the Bible. That is something I have done 10 times in almost 20 years. My mom would often get up early and read her bible and pray. I tried this over and over again but often just fell back to sleep. I am just not an early riser. Sorry mom. Still passion was instilled in me to continue to read the Bible. My dad would spend hours studying the Bible to find its meaning. Not only did he read the Bible but he also read opposing views. He read Jewish newspapers, pamphlets from different denominations, went to seminars not of our denomination, etc… Sometimes dad would say, “That is an interesting theory. They may have something there.” I am so much like my dad in this way. I read everyone’s beliefs and dive into the Greek and Hebrew scriptures, sometimes just for fun. (Geek) I listen to everyone’s point of view and discuss it with them. Why would I want to turn away an opportunity to learn? I also love to read books, like “the Odes of Solomon”, “Thomas’s Gospel of the infancy of Jesus Christ”, Clement, Barnabas, Adam & Eve and so much more. Did you know we even have those books? I was encouraged to read books like these by professors but that is another story. I am very passionate when it comes to God. Maybe too passionate at times. I always here Spock saying “You must learn to govern your passions; they will be your undoing.” Ahh, the Geek in me comes out again. Without passion, nothing changes. We stagnate. My passion has driven me to read everyone and everything so that I can make a logical conclusion. This is hard sometimes when I want to hold on to everything I’ve always been taught and I find that there seems to be a better way or understanding of that belief or idea. I have endured many headaches in the search for God, but in the end it has always brought me peace. 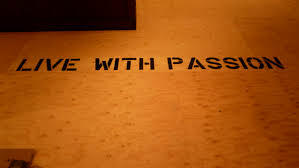 Do you have passion in your life? I think you probably do. You may not have a passion for the Bible or history, but God has given you a passion for something. Use that passion, but don’t let it rule you. Make it an everyday part of your life. Use it to change yourself and those around you. Passion makes the world go round.